Painter of portraits and flowers. Pascal De Beucker was an excellent painter with an eye for detail. He was a pupil of the Antwerp Academy. Around 1904 he spent two years in the United States, encouraged by the painter of miniatures Robertson, who had detected his talent from an early age. He had lots of success in Springfield as a painter of portraits, which were famous for their natural appeal and liveliness. In 1910 he returned to Belgium, he got married and settled down in Mortsel. 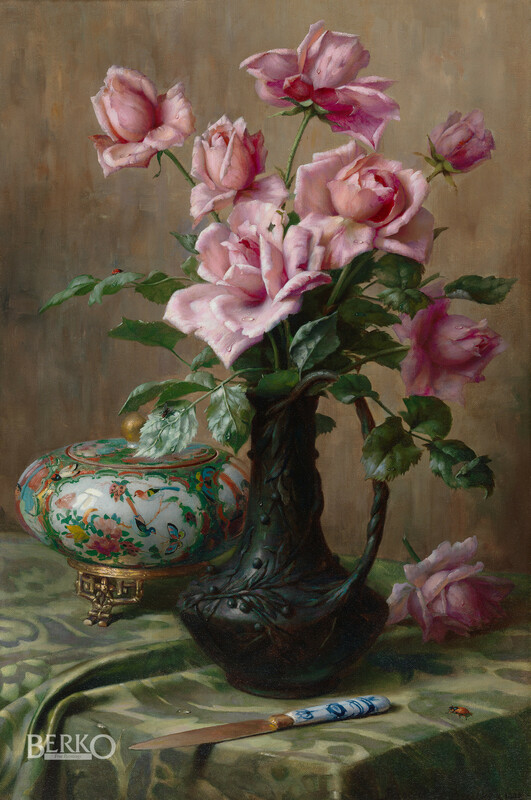 De Beucker became a virtuoso painter of flowers and excelled in the depiction of roses. Exhibition: Retrospective ‘Pascal De Beucker’, Albert van Dyck Museum, Schilde 2000. P. & V. Berko, "Dictionary of Flower Painters; Belgian and Dutch Artists born between 1750 and 1880", Knokke 1995, p. 120.